Have You Met Other Indies? Writing groups have always been fairly popular with authors. It’s a good place to talk craft. Get feedback on your work and just be one with the written word. However in the digital age of indie publishing they have taken a bit of a back seat. More and more authors meet up online on forums, chat rooms, Facebook, Goodreads and even on Google Hangouts. While physical writing groups still exist (and do well) they like many physical places have to take a back seat to our ever growing reliance on technology. This past Friday I had a chance to meet two indie authors in person for the first time. I’ve met authors before at a local writing group. I’ve met others at conventions and book signings, then mostly as a fan. It’s the first time I’ve met two people in the flesh that have gone the indie route. Demelza Carlton who is a Perth based writer (like me) and a fan of this podcast was one. Erica Conroy was the other. She is based in New Zealand, and was visiting Perth with her husband. We chatted for several hours about writing, publishing, marketing and a bunch of other things. We laughed. We talked strategy. We talked about podcasting and other ways to get noticed in this busy environment. We ate food. They were smart and ordered the tasty looking chilli beef chips (fries for our American friends) and I chose the small chips and gravy. The large plate looked a bit much for one person to handle for a light lunch snack. It was priced around $7.50 (Perth is expensive at the best of times) so I took the smaller option. 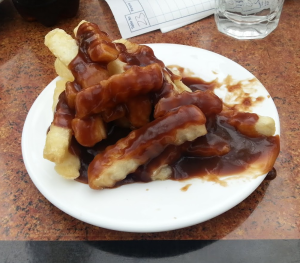 I was rather shocked when one of the smallest plates in the history of man (it looked like a saucer) came out, with chips somehow piled on it. It was coated in thick brown gravy that found more time on the table than in my mouth. I enjoyed the experience and getting to know both Erica and Demelza outside of the chat space of this website, Google+ and Twitter. Have you had a chance to meet up with other indie authors in your city or on travels? What did you talk about? Did you enjoy it more being face to face than online? I’d love to hear your author meet up stories in the chat below.